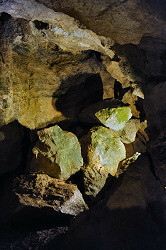 Image: debris in the Laichinger Tiefenhöhle, Germany. Breakdown is a speleologic term which means all kinds of collapse related processes as a matter of cave formation or cave development. In most cases this means rock falling from the ceiling of a cave and forming heaps of debris at the floor. In active caves, caves with a river running through, the debris is continually moved out of the cave by the cave river. In fossil caves, caves without a river running through, the debris forms a heap on the floor of the cave. While the ceiling moves up by loosing rocks, the floor also moves upwards by being coverd with the debris, and after some time the original cave is completely filled with debris. The cave is slowly moving upward, until it is a completely new cave above the old one. Breakdown is a mechanical process and not restricted on soluble rocks like karstification. This process happens with any kind of underground void, both natural and artificial. In natural caves it is an important factor of cave formations, but it is also a process which forms caves in unsuitable rock. A widespread and important example is underground mining. Abandoned mines, if not refilled, tend to create even faster Breakdown processes than natural caves. So there might be a cave passage now, above an original mine tunnel which is completely filled in. It is still discussed if this might be called a cave, or in other words if the result of this natural process a natural cave is. Of course it could not have been formed without the existence of the mine, which was artificial. Search Google for "Breakdown cave"